Watch the video on the right to learn how the community works. 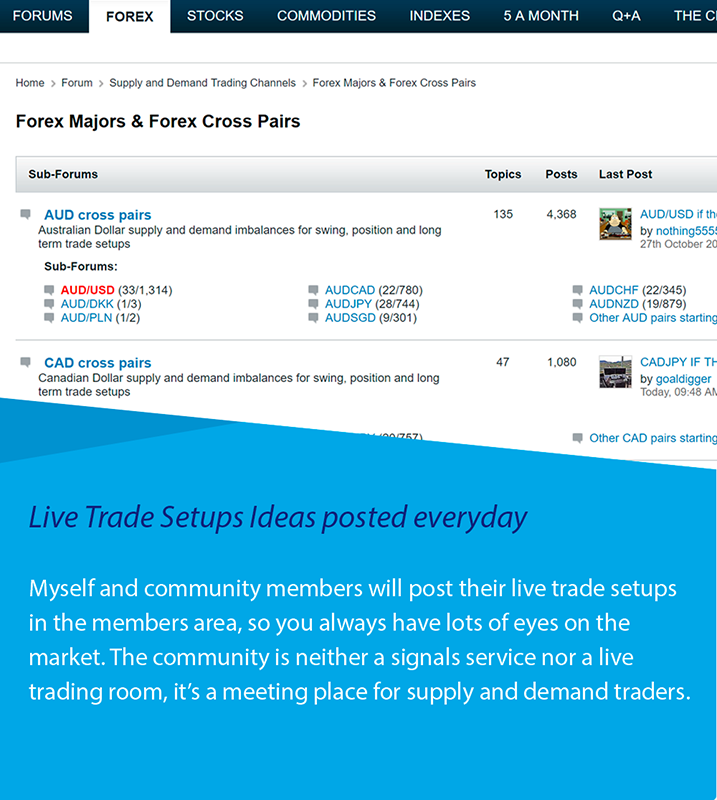 Check out all the live channels available for Forex, Stocks, Commodities and Indexes. Thousands of trading analysis and commentaries, active since October 2013. We trade Forex, Stocks, Global Indexes, Commodities, Futures and CFDs; a wide range of instruments to help you spot specific trade setups every day. We don’t believe in spending a few hours a day in a chat room talking about potential trade setups and banal things about life, resulting in no trading at all. Trading is boring, applying a rules set is boring. Trading is not a game, we must treat for what it is. It is a way of making a living, it is a business and should be treated as such. As a member of the community you will benefit from daily setups posted by other community members, where you will see trade setups posted before they will actually happen. Where you will see actual trade set ups work and play out, “Real Time” just as the they were intended to do, following the strict rule set. You can also use our Stocks analysis to trade options. Buying and selling options at supply and demand imbalances where professional traders and filling their orders and hedging their positions. Protect your investment with married puts and sleep well at night as stocks grows in the expected direction. You can't lose more than what is at risk. Set and forget is not a signal service but if you know the rules you will be benefit from high odds picks and trade setups on Forex and American stocks. If EURUSD or SP500 index are in a clear uptrend, the imbalances where the long setups will be valid will be mentioned in the weekly picks list. Many of these setups will be spotted by senior members, charts will be uploaded and you will be able to make a decision based on your risk profile. Weekly video analysis are uploaded every week for 28 Forex cross pairs, 12 indexes including S&P500, Dow Jones, Nasdaq and Russell 2000, BitCoin and Ethereum crypto currencies, Gold, Crude Oil and Brent. The community has evolved since it was first launched in October 2013. Not only are there traders but also programmers and designers. These members are willing to help the community by making what they do best. Some have build advanced spreadsheets to keep a log of your trading decisions and setups, new tools have been developed for Metatrader 4 platform, Trading View, Forex Tester, etc. These tools will be of great help on analysis, they won't add any layer of complexity to your trading decisions, just the opposite. You can benefit from all these tools provided by other fellow members, sharing and helping is what the community is all about. 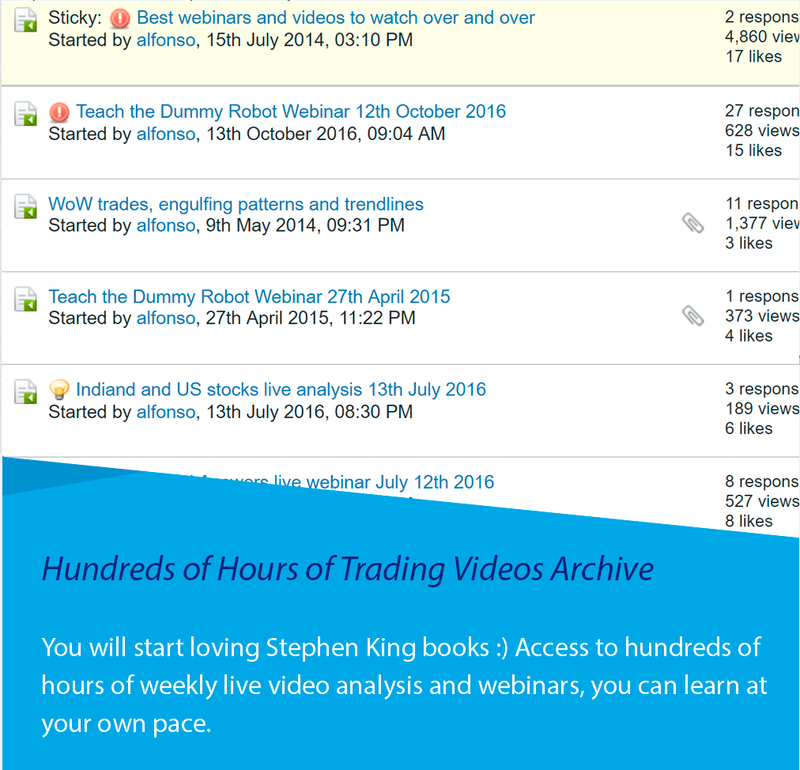 Unlimited access to a large resource of archived video content with hundreds of hours of live analysis and webinars. You will have unlimited access to a vast resource of hundreds of hours of archived webinars, lessons and weekly video analysis. These videos have been compiled since the community was first launched and can be used as part of your learning process since they refer to past and present live scenarios. You can go through them at your own pace, like reading a long Stephen King book. Every video you watch will give you new insights and knowledge on how supply and demand works and how these supply and demand imbalances control the markets. Be part of a worldwide growing community of like minded supply and demand traders all trading with the same rule set, no more clouding your mind with different strategies. Obtain unlimited support from numerous senior members who are willing to help you the same way they were helped by others when they started. Sharing your analysis and interacting with other traders will help you develop your skills and confidence in the markets. Benefit from live trade setups posted every day. The community is not a signal service but there are many trading opportunities shared by members if you know how to apply the rules. 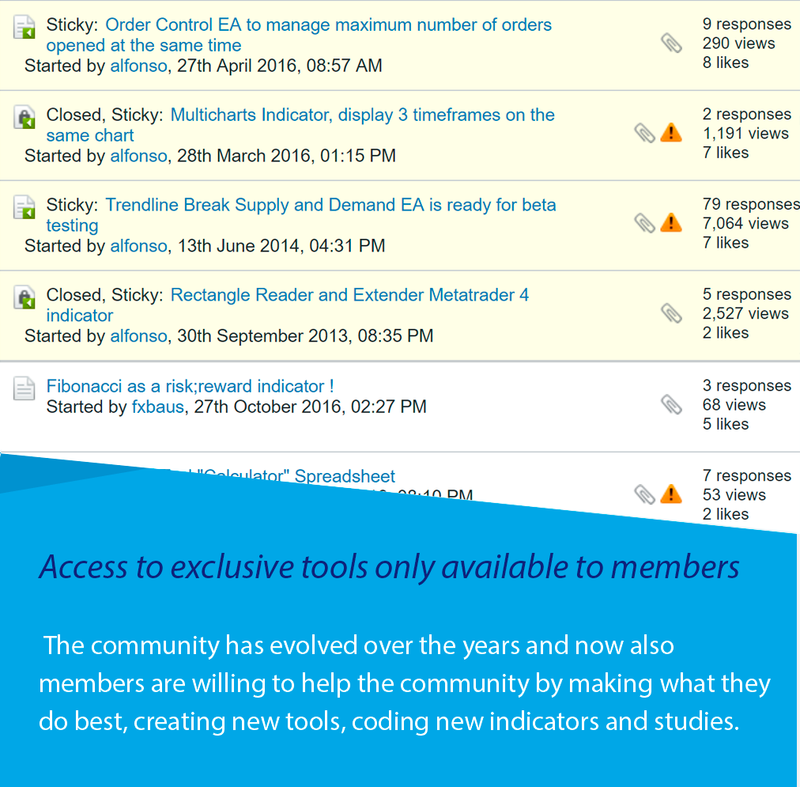 Access to exclusive tools only available to members, many of these tools have been developed by other members. This is what a community is all about, sharing our knowledge and work with others. Participate in a couple of free meetups a year where we will do live analysis in the morning and outdoor activities for the rest of the day in key cities around the world. Develop a winning mindset and learn how to manage your money like a professional with the support of other fellow traders. Grow not only as a trader but also as a human being. Learn skills on how to manage your emotions and execute a daily routine that will put you on the right path.